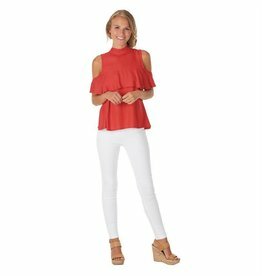 Cold Shoulder Viscose top features chest ruffle flounce and keyhole back with double button closure. Measures approx. 23 3/4" from shoulder to hem on size small. Yarn-dyed, off-the-shoulder romper features gathered elastic at neckline, three-quarter length sleeves and twisted white rope drawstring waist. Measures approximately 28" from shoulder to hem on size small. Lightweight crushed poly crepe sleeveless top features layered and staggered front panel detail. Measures approximately 26" from shoulder to hem on size small. Crushed poly crepe sleeveless shift dress features standing collar, scalloped hem and pearlized button at back closure. 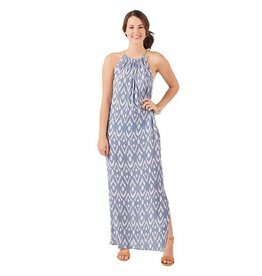 Measures approximately 35" from shoulder to hem on size small. Lightweight poly crepe sleeveless shift dress features sheer maxi-length overlay with dramatic side vents and keyhole back with domed button closure. Measures approximately 56 1/2" from shoulder to hem on size small.